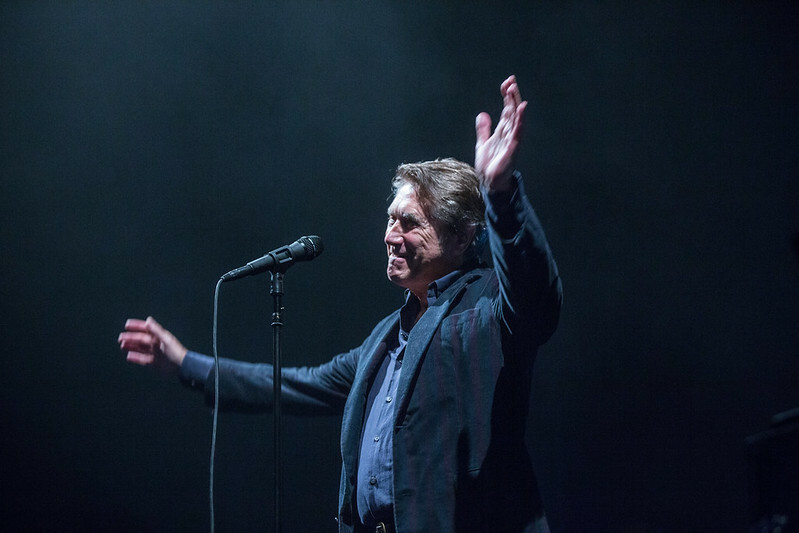 BOSTON, MA – JULY 31: Bryan Ferry plays a re-scheduled performance in support of his latest record, Avondale, with a healthy dip into the Roxy Music songbook. Shot at Blue Hills Bank Pavilion in Boston, Massachusetts on Sunday, July 31, 2016. Has anyone ever looked as suave and debonair as Bryan Ferry, the man who practically invented the insouciant half-unraveled tuxedo bowtie look and turned it into a template for coolness? It certainly helped that he inherited some amazing DNA from what we can assume is the deep end of the gene pool, and matched it with a quavering voice that can melt hearts on command. And here he stands, seventy two years old, gleaming that magnificent smile and crooning his way into the collective hearts of the audience. Having cancelled his 2014 show that was in support of the then-new Avonmore record, this re-scheduled date would see a few of those songs played, but the real meat of the set list was fourteen Roxy Music songs, as well as the handful of artfully interpreted covers that he took on as a solo artist. Has anyone ever really owned a song not their own as Ferry’s done with John Lennon’s “Jealous Guy”? I can’t think of any. Of course any breathing human would love to see a Roxy Music reunion (especially if for some extraordinary reason Brian Eno decided to take part), but my research tells me that it’s been thirteen years since they played the US, so don’t count on it. But that wasn’t really a huge deal, as he’s assembled an absolutely crack band to flesh out all of the nuances of their psych/glam sound. Highlights were many, but the proto-sampling/re-appropriation of “Re-Make/Re-Model” and the green-tinged slow burn of “In Every Dream Home A Heartache” stood out, as did the about turn of “If There Is Something,” swinging sharply from a light-hearted C&W-tinged ditty to a forceful exhortation of his abandoned love, “I would do anything for you/I would climb mountains/I would swim all the oceans blue/I would walk a thousand miles” that gave way to the sax bringing the flame down to a simmer. Glam bands just don’t show that sort of range.